Inspired by EEVblog Guest Video: Raising Awesome - Young Dave Jones, a demonstration of building a Simple6502 computer, a minimal MOS Technologies 6502 computer using Grant Searle’s design: Grant’s 8-chip (or 7-chip) 6502 computer, I became interested in building a 6502 computer system. Grant also has minimal Zilog Z80 and Motorola 6809 designs, also from the 8-bit era. But the 6502 was famously used in the Nintendo Entertainment System and pioneering personal computers of the time. Building a 6502-based computer in the current year is an exercise in retrocomputing. So what are the specs of the Simple6502? You can run the Microsoft BASIC implementation from 1977, that’s pretty cool. But to make it you need at least a 6502 CPU (~$1.65), a 62256 32KB RAM (~92¢), 27128 16KB ROM (??? ), and interfacing and glue logic. Could be a fun project, but the price quickly adds up. How would the Simple6502 compare to a modern, yet dirt cheap (~$1.69), microcontroller such as the STM32 Blue Pill? The blue pill only loses on RAM. This is unfortunate, but not fatal. The NES only has 2 KB internal RAM, as a point of comparison. External RAM could possibly be added, I happen to have a 64KB DRAM chip, see Sanyo LM3364K dynamic RAM (DRAM) pinout decoding, but connecting it to the microcontroller is non-trivial so I’m sticking with the built-in RAM for now. Since the blue pill is at least as powerful as a 6502 system in all regards but the RAM, could it reasonably emulate a 6502? Make a small NES emulator? The 72 MHz ARM should be more than be able to keep up with the 1.8 MHz 6502 and PPU. 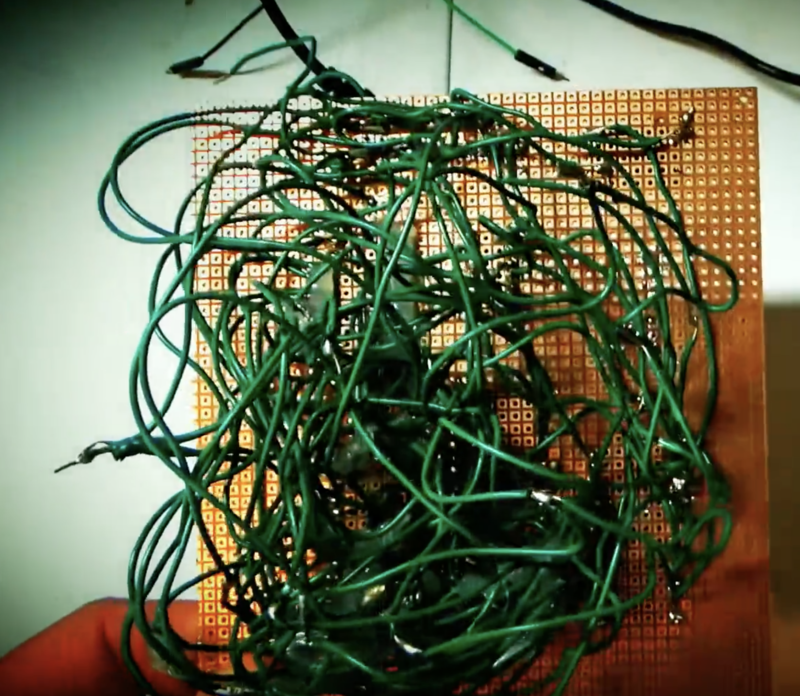 If this is possible, then the blue pill may be able to usefully serve as a low-cost widely available component of a retrocomputer, and it could still integrate with other peripherals, perhaps even maintaining some semblance of compatible pinout. What emulator to port? Nesdev wiki: Emulators shows the most popuilar NES emulators, which all include 6502 processor emulation. higan is a multi-system emulator, source code at GitLab, “unofficial”: https://gitlab.com/higan/higan. The author has major plans: 2018 goal - NES emulation improvements. Or how about Nestopia UE? Source at GitHub: [https://github.com/rdanbrook/nestopia])(https://github.com/rdanbrook/nestopia), and it is cross-platform. Executed mkdir build; cd build; cmake ..; make but it required libarchive; need prerequisites to install. Is there a more lightweight embedded 6502 emulator? Something less complete, but smaller. KNES was speed-written in a few days with minimal dependencies, looks promising, but only supported Windows and Linux. Nestopia, or some variant of it, is probably the best bet for a complete NES emulator. 6502 on a Microchip PIC, or an Atmel ATmega, but the blue pill is an ARM, and there are several ARM-based 6502 emulators. Going through each in turn. * run on an AVR processor. Now this is what I’m looking for! Code Golf: Emulate a MOS 6502 CPU, Mike Chambers posted his fake6502.c. Looks quite promising. But to complete the survey, what else is out there? On that note, Stardot is a small but thriving community around the BBC Micro, and Acorn Computers’ other machines – the Acorn Atom, Acorn Electron, BBC Master, BBC Master Compact, and the Archimedes/RISC PC machines. The author of PiTubeDirect is an active poster there, and the tone is generally very friendly and on-topic. I’ve been reading/posting for the last year or so and it’s turned Acorn-focussed retro hardware into my favourite hobby. I’d highly recommend taking a look if you used/loved one of these machines back in the 80s/90s. Indeed, this is the ARM of Arm Holdings as in “Acorn RISC Machine”, who still license (newer versions of) ARM processor cores today, including the ARM Cortex-M3 in the infamous STM32F103 blue pill. Small world! Corporate wankers having final control on what you do or how you do it. …under $20, I can do you one better Chris, the blue pills are under $2, an order of magnitude cheaper than the STM32F4DISCOVERY kits. 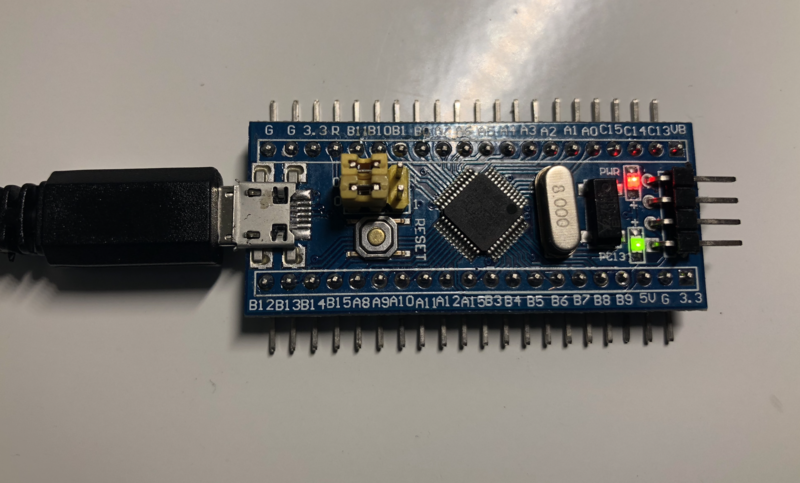 But he’s made progress towards what I was also aiming for, looking through the code, it implements a USB CDC-ACM virtual serial port (see my previous post about what this is and why it is useful: Triple USB-to-serial adapter using STM32 blue pill, and pill_serial). This obviates the need for any interfacing chip, either an a separate USB-to-serial adapter or the Asynchronous Communications Interface Adapter (ACIA) as in Simple6502. stm6502 even uses libopencm3, which I previously became familiar with in JTAG/SWD debugging via Black Magic Probe on an STM32 blue pill and blinking a LED using STM32CubeMX, libopencm3, and bare metal C, and have had good experience with. // cpu.c -- memory access routines for the stm6502 virtual cpu. On [the STM32F4DISCOVERY] dev board, the CPU runs at 168MHz and the emulated speed of the 6502 is 18MHz. WDC’s 65c02 and 65816 are rated up to 14MHz. An FPGA T65 seems to promise about 40-50MHz. How fast is the emulated 6502 of the 30 MHz tgl6502? The readme doesn’t say, but given the blue pill runs at 72 MHz, and 168 MHz / 18 MHz = 9.3 for a6502, 72 MHz / 9.3 = 7.7 MHz, several times the Simple6502 and NES speed of 1.8 MHz. Would not expect performance to be a problem for emulating 6502 on the STM32F103 blue pill. 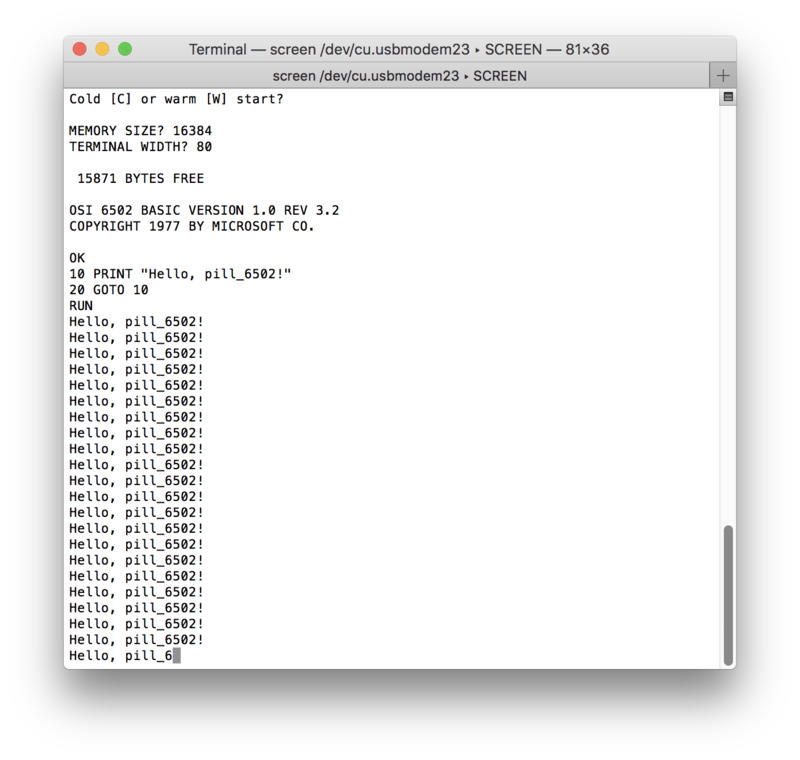 Has anyone emulated 6502 on the STM32F103 blue pill yet? Searching the 6502.org forums, found only two posts: 1, 2, by stecdose in December of 2015. 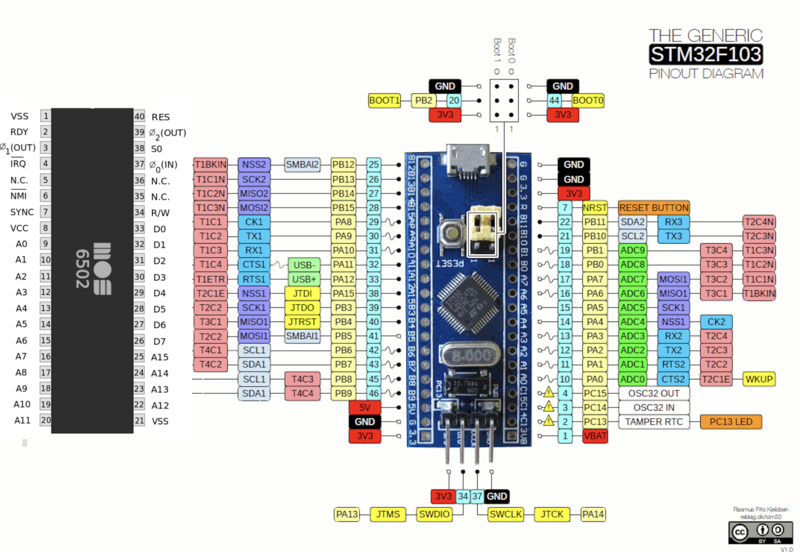 But there are different variants of the STM32F103, stecdose’s has 256KB flash and 48KB RAM, more than the blue pill’s 64/128KB and 20KB. I’m working on an emulator on an STM32F103 with 256kb Flash and 48kb RAM. It is written in C. The CPU ist just below 900 lines. It uses ~9,5kB of Flash and ~50bytes of RAM, exculding the emulated memory. I’ve assigned a few k to this emulator and assembled the skier and the random demo from 6502asm.org. Both are running at about ~1,03MHz without graphics. At the moment I’m working on an emulator on a STM32F103, 72MHz, 48k RAM, 256k flash. My first approach of adopting some existing code gave me ~1.03MHz without graphic output. I have a 3,2” 320x240px TFT connected and wrote some code to have a 32x32px graphics output. It is zoomed by 7 to see something on that small display. At the moment this is takes more than emulating the 6502. It slows the whole thing down to ~440kHz. The plan is to connect two SIDs to it as well and two Joysticks. Maybe the display has to move away for a SAA7182 scart rgb interface. Up to now there’s not much working but of showing a test-screen that i have to bitbang into that chip, no idea how to interface this properly and fast with a STM32. but stecdose (Nils) last visited Sun Jan 03, 2016 11:47 am, hasn’t posted since 2015, doesn’t appear to have shared his code, so, let’s forge ahead. Porting a6502 or tgl6502 could be a worthwhile endeavor, but I decided to make my own just for fun. I’ll use fake6502 as the processor core. At a crossroads, we could implement low-level hardware support by hand, but I went with the libopencm3 library. To help interact with and test the device, it is useful to have a serial interface first. As a base, started with code originally from the Black Sphere Black Magic Probe, adopted into Pill Duck: Scriptable USB HID device using an STM32 blue pill, from mouse jigglers to rubber duckies. There is a lot of boilerplate code here, the details are not too relevant to this project, but it is important. If other code added causes a similar error, we’ll know the emulator RAM needs to be decreased, or the code that was added needs to be optimized to reduce memory usage. Of course, it isn’t executing anything useful yet. To do so, a ROM needs to be loaded. Grant’s 6502 computer includes a link to osi_bas.zip, containing osi_bas.bin, a 16384 byte ROM file to be loaded at 0xc000-0xffff. Now this object file can be linked with our program, and the 6502 memory read function modified to access it at the proper emulated offsets (0xc000-0xffff). objcopy can be used to generate a raw binary file by using an output target of ‘binary’ (e.g., use -O binary). When objcopy generates a raw binary file, it will essentially produce a memory dump of the contents of the input object file. All symbols and relocation information will be discarded. The memory dump will start at the load address of the lowest section copied into the output file. but shouldn’t -B bfdarch create these symbols? -B bfdarch –binary-architecture=bfdarch Useful when transforming a architecture-less input file into an object file. In this case the output architecture can be set to bfdarch. This option will be ignored if the input file has a known bfdarch. You can access this binary data inside a program by referencing the special symbols that are created by the conversion process. These symbols are called _binary_objfile_start, _binary_objfile_end and _binary_objfile_size. e.g. you can transform a picture file into an object file and then access it in your code using these symbols. but I ran into a problem: .bss overflowed again: section .bss' will not fit in region ram’, and region ram' overflowed by 14984 bytes. This means the ROM is being loaded into RAM. nm shows "D" section, indicating data. Even if I declare as const`, same problem. Hrmph. It is also possible to rename the symbols that are created by objcopy using the “–redefine-sym” option, and also put the data in a section with a different name and different flags, using “–rename-section“. –rename-section oldname=newname[,flags] Rename a section from oldname to newname, optionally changing the section’s flags to flags in the process. This has the advantage over usng a linker script to perform the rename in that the output stays as an object file and does not become a linked executable. osi_bas.s reads the ACIStatus register in MONCOUT and MONRDKEY, checking bits 1 (transmit data register empty, TDRE) and 0 (receive data register full, RDRF), respectively. This implements flow control, allowing the 6502 to wait until the 6850 transmitted the byte in the ACAIData register before writing the next byte, and likewise for receiving data. > Cold [C] or warm [W] start? To make it easier to use, added a USB reset callback to reset and resume the 6502 processor, so it starts when the USB cable is attached to the host computer. Now to add user input. Cold [C] or warm [W] start? C� � old [C] or warm [W] start? There are still “�” replacement characters after the first byte, not clear what these bytes are, and they are not visible when connecting to the serial port with pyserial. Maybe some control characters used by the terminal. Anyways, time to write BASIC. indicating most of the emulated 16KB RAM is available. This is only a start, there are a lot of possible improvements that could be made to pill_6502. Most of all, tightening up the performance. 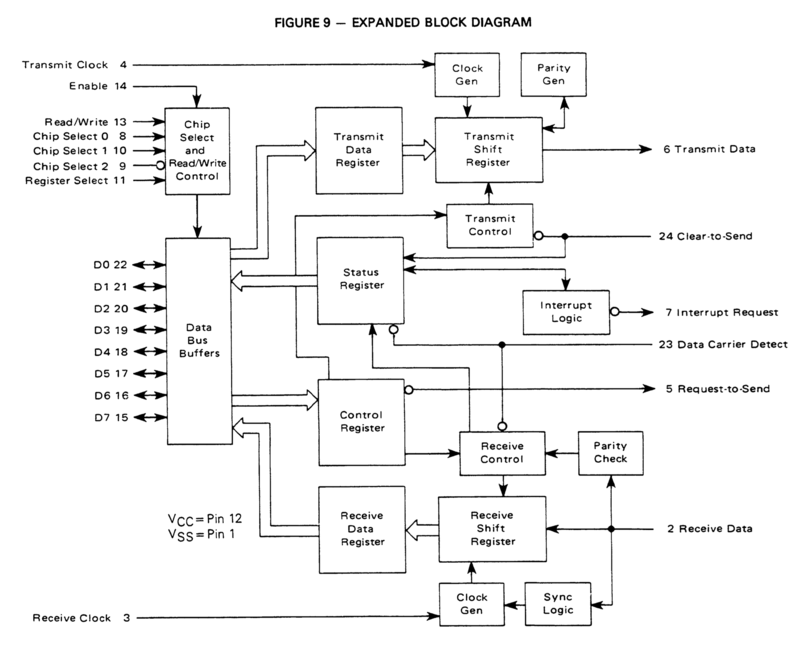 Executing 6502 instructions on a systick timer every 1 millisecond gives about a 1 kilohertz clock rate, slightly faster for instructions taking more than one cycle, this certainly is not the best way to do it. The systick interrupt has excessive overhead as well. fake6502 supports exec6502(uint32_t tickcount) to execute multiple instructions in one go, and furthermore, it would be nice to have cycle-accurate emulation like on good NES emulators: check clockticks6502 and delay as needed compensating to emulate accurately. Emulating more hardware is another possible area of expansion, but even cooler, in my opinion, would be to expose the emulated 6502 CPU’s address and data bus as well as the interrupt pins IRQ and NMI, and SO overflow status bit pin. Interface with real hardware, as part of a larger retrocomputing system. Speed it up, then use it as a replacement for a real 6502 CPU + 62128 16KB RAM + ROM + 6850 ACIA?